RKA Receives "Professional Builder Design Award"
EL SEGUNDO, CA (September 14, 2018) — Rockefeller Kempel Architects (RKA) has been named a winner in the annual Professional Builder Design Awards contest. 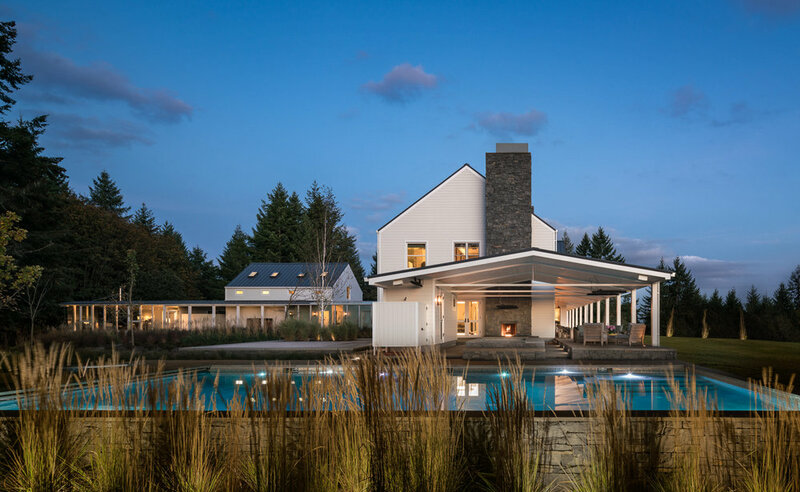 Beating a competitive group of entrants, RKA earned Gold in the Custom Home category for its 8,200 square foot farmhouse located in the Willamette Valley of Oregon. Located on 83 acres, the Willamette Valley Residence is a balance between modern and traditional architecture, bringing contemporary elements and amenities to a rustic farmhouse style. It combines the three key elements of a farmhouse (a rural location, a functional porch and a combination of formal and informal spaces) and captures the LA lifestyle of indoor / outdoor living. The Professional Builder Design Awards recognize construction industry professionals - builders, architects, designers, developers, land planners, and interior designers - across the country for design innovation and superb attention to detail, as well as a high level of construction quality and success in the marketplace. This year's awards named eight gold, six silver, and two bronze winners in categories that include custom homes, multifamily, and single-family homes of various sizes. The winners were selected by a panel of esteemed build and design experts that included Joe Atalla, president of Berkeley Building Co., Meridian, Idaho; John Guilliams, partner/director of design at KGA Studio Architects, Louisville, Colorado; Scott Sanders, CEO/managing partner of BrightLeaf Homes, Hinsdale, Illinois; and Allison Iantosca, partner at F.H. Perry Builder, Hopkinton, Massachusetts. RKA’s farmhouse residence is featured on the cover of the September issue of Professional Builder magazine wherein the PB Design Award winners are profiled. More on the winners and the award can also be found online at www.probuilder.com. Since 1936, Professional Builder has remained dedicated to serving the needs of the nation’s home-building community — builders, architects, designers, trade partners, and suppliers — with award-winning content and proven, practical solutions. The magazine is published by SGC Horizon, a division of Scranton Gillette Communications, and serves an audience of more than 112,000 leading decision makers in the home-building market. For more, visit www.probuilder.com.